St. Croix Valley’s Complete Source for Pools and Spas-Sales, Service, and Supplies. Valley Pools and Spas of Hudson is a family owned and operated pool and spa business. We are St Croix Valley’s complete source for pools and spas—sales, service, and supplies. Our employees are trained and certified in all areas of the business. We can help you with all your swimming pool and spa needs, from purchasing the pool or spa, caring for them and servicing them. We are happy to partner with major brand names in the pool and spa industry. Some of these brands include Marquis Spas, Bioguard, Super Steele, Holland Grills, Splash, Pentair, Gli, Polaris, Hayward and many more. We are here to meet the needs of our customers. 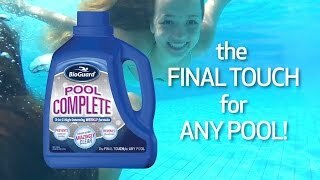 Take your pool to the next level with BioGuard® Pool Complete™, the weekly maintenance product that produces water that’s simply AMAZING to behold. It’s hard to describe the visual results, but even pool owners with routinely good-looking water find their water simply remarkable. Stop in and see how this product will turn your pool Hi-Def! Request a Quote from Valley Pools & Spas of Hudson.